Kratie is a small town perched on the banks of the Mekong River about seven hours north of Phnom Penh (10 hours if your bus breaks down); this was our last stop in Cambodia before we headed back into Laos. 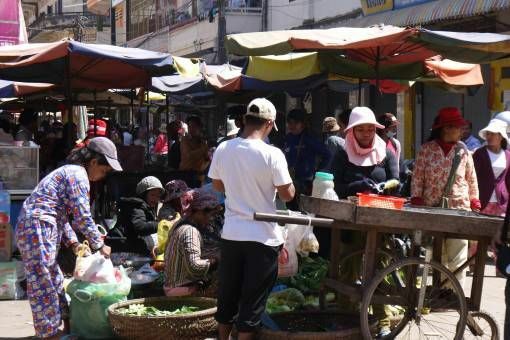 There’s a sprinkling of guesthouses and restaurants in Kratie, although the food isn’t anywhere near as good as in the other Cambodian towns we visited and there’s also a market complete with pyjama-clad women selling their various wares. 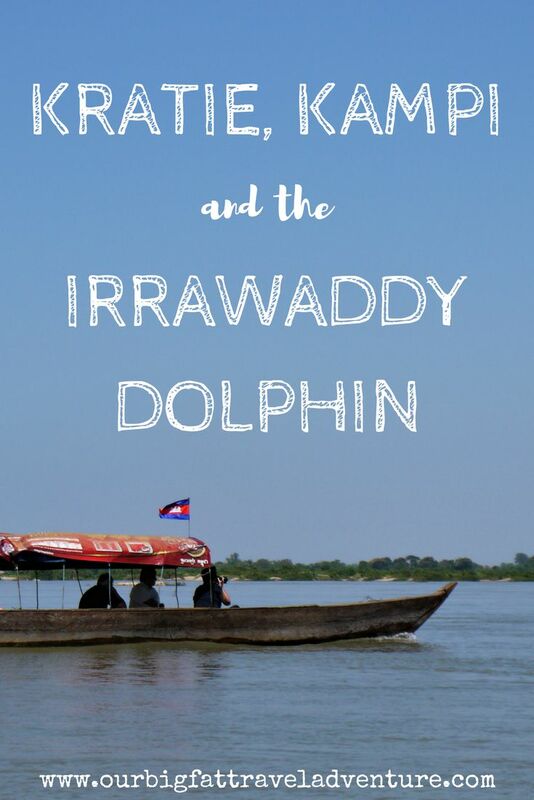 What we were really in town for though was the chance to spot some rare Irrawaddy river dolphins. 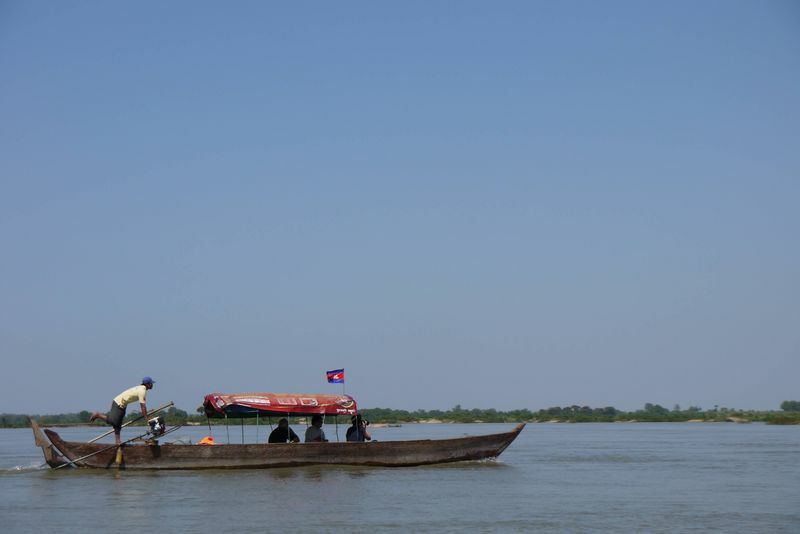 The nearby village of Kampi is the best place in Cambodia to spot the rare and endangered Irrawaddy Dolphin, of which there are only about seven thousand left worldwide. Although the dolphins are named after the Irrawaddy River in Myanmar, they’re actually present in about eight places between India and the Philippines; we saw them along this stretch of the Mekong, which ends close to the Four Thousand Islands of Laos. You can get to Kampi a number of ways; you can hire a bike, scooter or motorbike with driver. We decided to hire and drive a scooter for the day so we could head out at our own speed. It took about 30 minutes to get up to Kampi from our guesthouse and we stopped a few times to refuel and take photos of the river-side views along the way. Unfortunately, it’s impossible to spot the dolphins from the riverbank as the one place they’re visible from has been walled off by locals. Instead, you have to pay £11 per boat to be taken out on the river for an hour to check out the dolphins; the more people you share a boat with, the cheaper the trip. Our boat driver knew exactly what he was doing because within minutes of setting off we’d spotted a few of the endangered creatures. Although it was pretty difficult to get any decent still shots of the dolphins, the video was a little easier; here are our best clips – I promise these are Irrawaddy Dolphins! 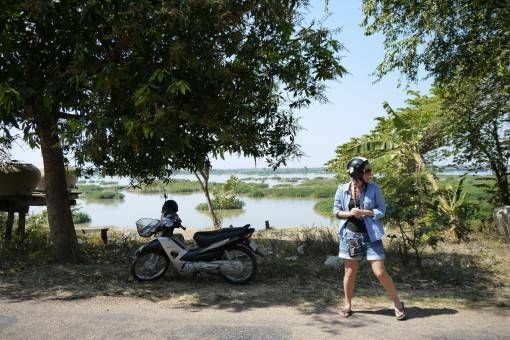 As we headed back to Kratie, we stopped off to pick up some sticky rice and water and were immediately approached by some local women wanting to practise their English with us. They were so eager that they barely let us finish our sentences before firing-off the next question; they were so happy of the chance to speak to real English people. It turns out that Kratie, like just about every other town we’ve visited along the Mekong, has some spectacular sunsets and we finished the day by watching the sun set on our time in Cambodia. 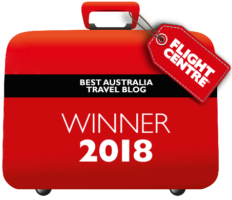 Have you seen the Irrawaddy Dolphins? Where did you see them? Sounds like a perfect day – motorbike ride, boat ride, dolphin spotting, sunset, you couldn’t ask for much better than that! So glad that you actually got to spot some dolphins as well, the problem with nature is that this sort of thing is never guaranteed. Killer sunset shot! And props for getting so close to nature and sharing info about something not many know about. Still haven’t seen dolphins in the wild, hope these guys will flourish in the future. Great sunset shot! 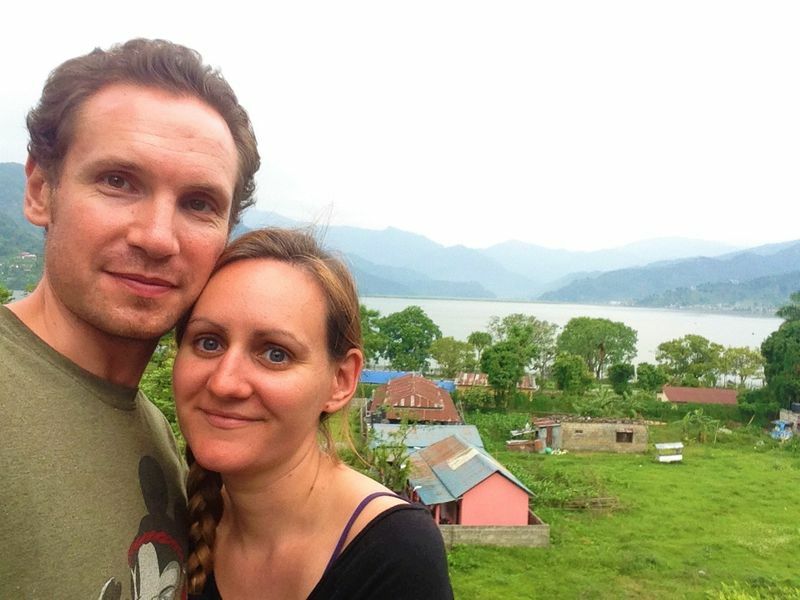 I love when local people get excited to practice their English, moments like that have been some of my favorite travel memories. Between that and the dolphin boat ride and sticky rice, I’d say that might just be a perfect day!